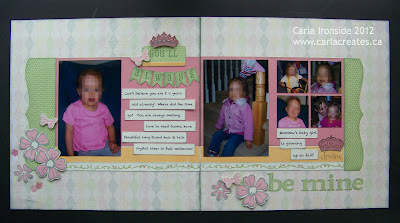 A new two-page layout for you today created using CTMH's Lucy Workshop Kit. CTMH has done all of the page planning & design on this one - all I had to do was follow the directions and add my photos! This girly kit was perfect for photos of my sweet daughter! The Lucy workshop kit includes a full colour workshop page guide and full Lucy paper pack. I used the Cricut Art Philosophy cartridge for many of the die cuts (including the flowers). The stamp set included with the Lucy workshop kit provided many of the images you see. I also used the Trinity Alphabet stamp set for the title. The Lucy glitter rub-ons (also included in the workshop kit) provide the fabulous & fun glittery details! I printed my journalling on cardstock and then cut into strips to add to the layout. Hope you all have a great weekend. The past few weeks have been really stressful around our house (more about that in a future post) - so I hope to enjoy a quiet, relaxing weekend (hopefully with a bit of scrapping)!